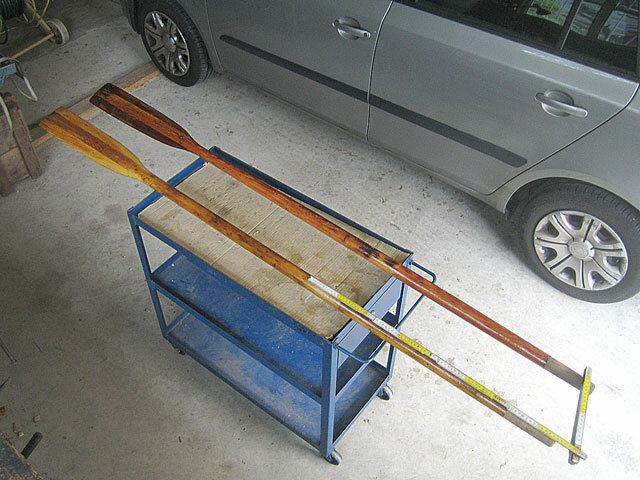 I needed a pair of oars for my 1954-vintage 12ft standing lug dinghy and managed to find a couple of old ones – although they were not a matching pair, only similar. So I removed the old plastic collars from them and the one brass blade end banding on one of the oars, then reworked the shape of the two blades until they were the same. Once varnished, the only real difference now is the colour – hardly surprising considering they never were a matching pair in the first place. I needed some leather to make a collar to suit the single thole pin on each side of the boat – plain, without protruding ring. I salvaged a leather sheet from an old school bag (I rarely throw away any old leather item) and soaked it overnight in a bucket of water to soften it. I marked the position of the centre of the leather on the oars at one half the dinghy’s beam plus two inches from the grip end. 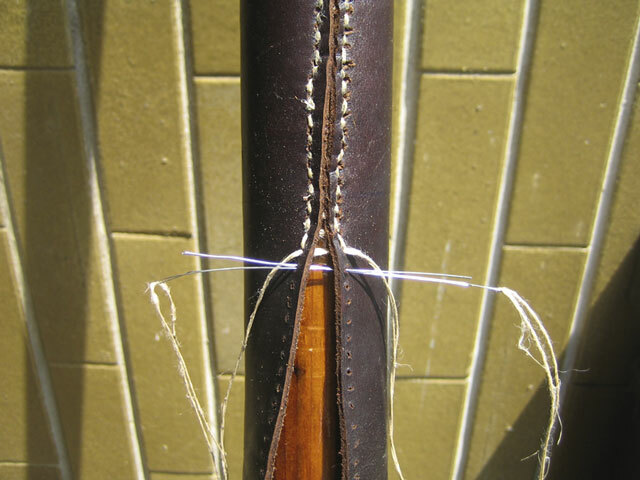 I measured the circumference of the oar shafts, then cut a narrow strip of leather which I could wrap around the shaft and accurately adjust to the width I needed for a tight fit around the shaft. I used this to measure the width of two 25cm (10in) long leather rectangles. 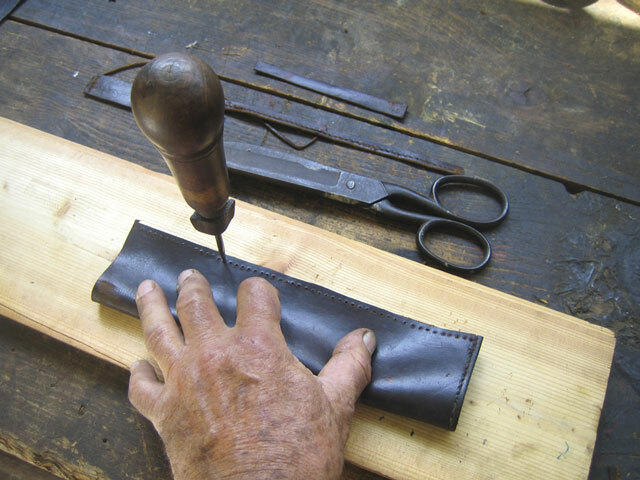 The leather must be secured on oars only by sewing – absolutely no tacks, as even copper tacks would cause the wood to rot. 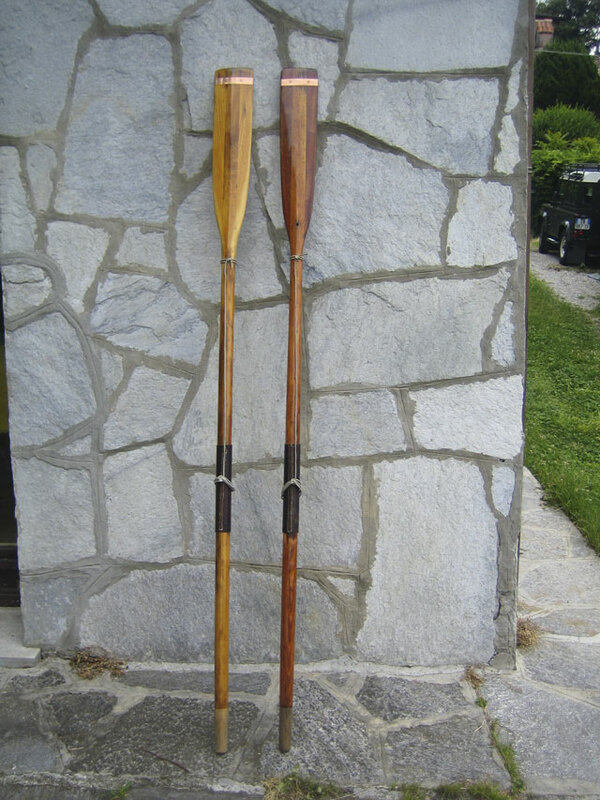 I used copper tacks for this purpose once, a long time ago – and that’s why I now needed new oars! Using the old school bag’s stitching holes as a guide for spacing, I pierced new holes along the length before starting to sew. I have some professional cobbler’s thread that should be soaked in pitch, but I didn’t have any pitch so instead I tried some natural pine resin collected from trees. This proved too old, dry and hard, so in the end I made do with wax. For threading I used two supple steel professional cobbler ‘bristles’, as they call them – perhaps because in the old days cobblers used real wild boar bristles pasted to the end of the thread by pitch. I sewed the leathers on the oars with a two-thread stitch I copied from newly leathered racing boat oars standing outside a shop in Portoferraio on the island of Elba. The slightly protruding leather edge protects the thread from wearing. Then I banded the oar blade ends with straps cut from copper sheet, made fast through the oar by countersunk head rivets. All that remained was to tie on the strops that sit over the single thole pins and that was it – job done. We showed how to make a pair of wooden spoon oars from scratch in PBO August 2014. You can buy the article from the Copy Service, tel: 01202 440830.